Israel’s President, Shimon Peres, has turned 88. Peres won the Nobel Peace Prize for his role in the peace talks that led to the Oslo Accords in 1993 with Israeli and Palestinian leaders Yitzhak Rabin and Yasser Arafat. He is a widely revered Israeli political figure. Born in what is present-day Belarus, Peres emigrated to Tel Aviv in 1934 and served under Israel’s first prime minister, David Ben-Gurion, helping to acquire arms and build alliances for the nascent state. Peres’ career spans 66 years, during which time he has served as prime minister and as a member of 12 cabinets. He is a staunch proponent of Middle East peace and economic cooperation in the region. The Oslo Accords, or Declaration of Principles (DOP), and the Israeli-Jordanian Peace Treaty are two examples of peace agreements Peres worked on that ushered in greater economic interaction between Israel and its Arab neighbors. Throughout his career, Peres pushed for Israeli-Palestinian peace. Recent reports suggest that Peres has been in contact with Palestinian President Mahmoud Abbas to try to encourage him to reenter peace talks with Israel. He recently told a group of Washington-based ambassadors and senior diplomats visiting Israel on a mission organized by The Israel Project that saving the life of a child, anywhere, is the greatest goal of a public servant. He said that peace building and climate change are two of the most important issues for him. He talked about Israel’s innovations in agriculture and said that Israel has managed to reduce its use of water by nearly half. He said that Israel is happy to share its technology with its neighbors. Peres also said that he has the highest regard for Palestinian leaders Mahmoud Abbas and Salam Fayyad. He said that a great achievement would be getting Hamas to accept the Quartet’s peace principles. “For peace you need a majority, yet for terror you only need a minority,” Peres told the ambassadors. He was speaking about the Palestinian bid for unilateral recognition of independence at the United Nations in September, saying that a U.N. document would not necessarily change the situation on the ground. “Will it change terror? Will it stop Iran?” he added. 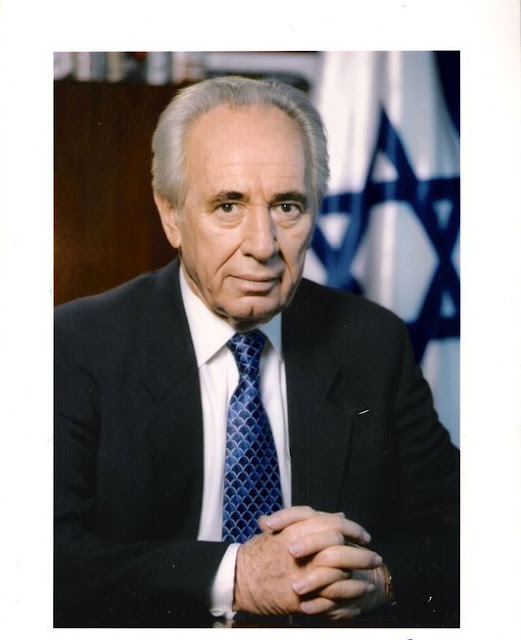 Note to readers: The exact date of birth of Shimon Peres is a matter of some dispute. According to Encyclopedia Britannica, It has been given as Aug. 16, 1923, by a number of official sources and biographers, but some uncertainty remains. The Office of the President of Israel and Michael Bar-Zohar’s authorized biography offer the Hebrew date of Av 20, 5683, which corresponds to Aug. 2, 1923, on the Gregorian calendar. Other sources—including an earlier authorized biography by Matti Golan—have given dates ranging from Aug. 1, 1923, to Aug. 21, 1923. Peres himself has not chosen to put the matter to rest, and public celebrations of his birthday have occurred on various dates in the month of August.